This unique shaped Natural Gold Nugget comes from the Bering Sea in Alaska. It weighs in at 3.5 Grains (0.22 Gram) and it measures 5/16" (8 mm) long. It has a very unique and interesting shape with what looks like crab claws on one end. If you have seen the TV show "Bering Sea Gold" on the Discovery Channel you will know how these gold nuggets are recovered by dredging in the Bering Sea off the coast of Nome Alaska. My source buys the nuggets directly from the dredge owners. He picks out the nicest cleanest nuggets without heavy mineralization for me and the rest are sold to other dealers or are sent to the refinery to be melted down into bars. I pay more for the hand selected nuggets, but that ensures that you are buying the highest quality natural gold nuggets available from Alaska. 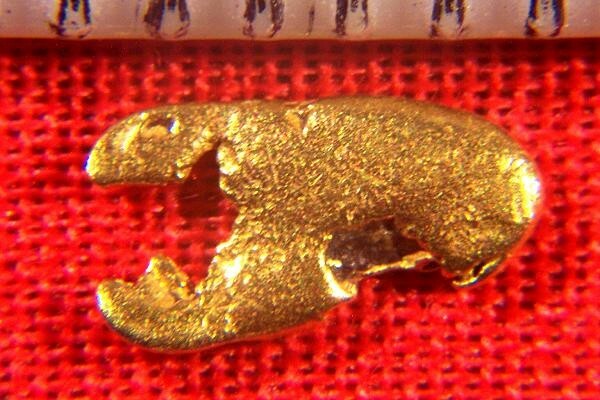 Only high quality gold nuggets are suitable for investment, jewelry, or collecting. We sell the highest quality there is. 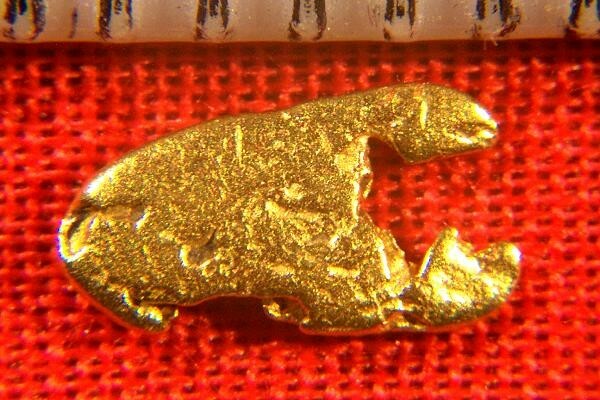 Jewelry/Investment Grade Natural Gold Nuggets like this are highly prized by jewelers and collectors and make a great investment.